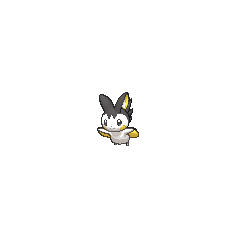 Emolga in game: 6,435 Who? Important notice! Pokemon Emolga is a fictional character of humans. Emolga (Japanese: ???? Emonga) is a dual-type Electric/Flying Pokémon introduced in Generation V.
Emolga is a white, rodent-like Pokémon resembling a flying squirrel. It has black eyes, a tiny nose, and yellow cheek patches. It can compose electricity on its electric sacs located on its cheeks and store electricity inside its membranes. Its ears, positioned at the top of its head, are rounded in shape and black in coloration, with yellow and white sections of coloration in the inside of its ears. It sports a vaguely hood-like patterning of black around its head, with a spiky extension of the pattern above its face. It has yellow winglike flaps connected to its three-fingered arms. It can use these flaps to glide from tree to tree, and it can discharge electricity while gliding. Its feet are white and fairly small and its black tail is in a jagged shape. Emolga made its anime debut in Emolga the Irresistible!, when a female Emolga was caught by Iris. Elesa used an Emolga in Dazzling the Nimbasa Gym!. A photo of an Emolga appeared in The Four Seasons of Sawsbuck!. An Emolga made a cameo appearance in Cilan Takes Flight!. An Emolga appeared in Crisis at Ferroseed Research!. An Emolga appeared in Lumiose City Pursuit!. An Emolga appeared as a plush toy in A Jolting Switcheroo!. A few Emolga appeared in Diancie and the Cocoon of Destruction. Multiple Emolga appeared in The Future Is Now, Thanks to Determination!. A Trainer's Emolga appeared in A Relay in the Sky! competing in the Pokémon Sky Relay. An Emolga appeared in Party Dancecapades!, under the ownership of a Pokémon Performer participating in a dance party. A Trainer's Emolga appeared in The First Day of the Rest of Your Life!. A Trainer's Emolga appeared in Alola to New Adventure!. Three Trainers' Emolga appeared in SM006. An Emolga appeared in SM008. BW024 Emolga Ash's Pokédex Emolga, the Sky Squirrel Pokémon. 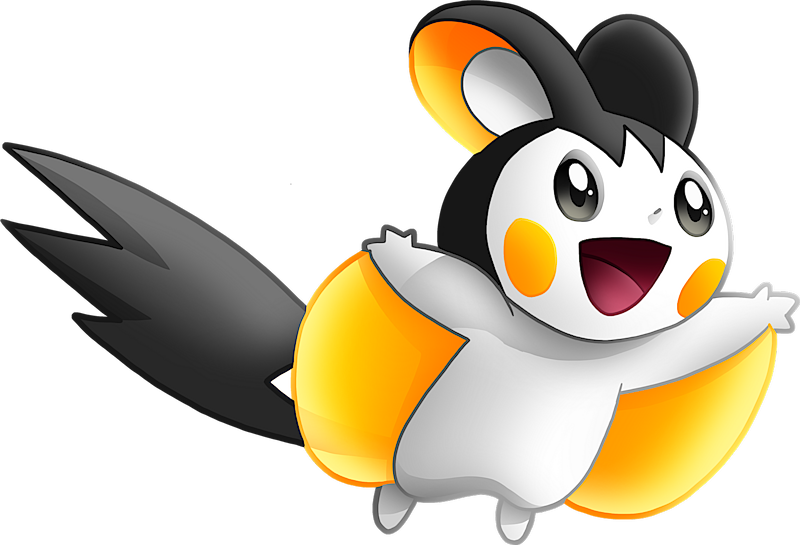 Emolga lives in trees and uses its cape-like membrane to glide through the air. An Emolga appears as the Burst form of Pikke. Elesa owns two Emolga as seen in To Make a Musical, where she was dressing up her Zebstrika in preparation of the Pokémon Musical. One of them was used later in a Gym Battle with Black. Multiple Emolga were among the Electric-type Pokémon that charges the Prism Tower during a blackout in Pangoro Poses a Problem. Elesa owns an Emolga in Pocket Monsters BW. Emolga appears in the background of the Prism Tower stage in the 3DS version of the game. If you heard someone talk about "a cute little rodent Pokémon with electric pouches in its cheeks," you'd probably think they meant Pikachu, but that description would fit Emolga, too! Much like Pikachu, Emolga is more than just a cute face. It glides down from treetops on its cape-like membranes to really shock its foes! Pokémon Mystery Dungeon: Gates to Infinity: Emolga is an important character in the storyline. The energy made in its cheeks' electric pouches is stored inside its membranes and released while it is gliding. It glides on its outstretched membrane while shocking foes with the electricity stored in the pouches on its cheeks. The energy made in its cheeks' electric pouches is stored inside its membrane and released while it is gliding. Moves marked with a superscript game abbreviation can only be bred onto Emolga in that game. He likes to ride on the wind, but he also loves the thrill of Hide-and-Seek. He cannot help looking for hiding places while he is flying. For other sprites and images, please see Emolga images on the Bulbagarden Archives. 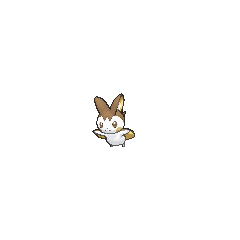 Emolga was first seen in an image on August 7, 2010. Emolga is the only Pokémon with a base stat total of 428. Emolga appears to be based on the Japanese dwarf flying squirrel and possibly the feathertail glider. Emolga is a corruption of Emonga. Emonga may be a combination of ?? emon (drapery/clothes/dress, referring to its patagium) and ???? momonga (scientific name of the Japanese dwarf flying squirrel).